This page French Revolution is part of the politics series. The French Revolution (Révolution française; 1789–1799), was a period of radical social and political upheaval in France that had a lasting impact on French history and more broadly throughout Europe. The absolute monarchy that had ruled France for centuries collapsed within three years. French society underwent an epic transformation, as feudal, aristocratic and religious privileges evaporated under a sustained assault from radical left-wing political groups, masses on the streets, and peasants in the countryside. Old ideas about tradition and hierarchy regarding monarchs, aristocrats, and the Catholic Church were abruptly overthrown by new principles of Liberté, égalité, fraternité (liberty, equality and fraternity). The royal houses across Europe were horrified and led a countercrusade that by 1814 had restored the old monarchy, but many major reforms became permanent. So too did antagonisms between the supporters and enemies of the Revolution, who fought it out politically over the next two centuries. Amidst a fiscal crisis, the common people of France were increasingly angered by the incompetency of King Louis XVI and the continued indifference and decadence of the aristocracy. This resentment, coupled with burgeoning Enlightenment ideals, fueled radical sentiments, and the French Revolution began in 1789 with the convocation of the Estates-General in May. The first year of the Revolution saw members of the Third Estate proclaiming the Tennis Court Oath in June, the assault on the Bastille in July, the passage of the Declaration of the Rights of Man and of the Citizen in August, and an epic march on Versailles that forced the royal court back to Paris in October. The next few years were dominated by struggles between various liberal assemblies and a right wing of supporters of the monarchy intent on thwarting major reforms. A republic was proclaimed in September 1792 and King Louis XVI was executed the next year. External threats shaped the course of the Revolution. The French Revolutionary Wars began in 1792 and ultimately featured spectacular French victories that facilitated the conquest of the Italian Peninsula, the Low Countries and most territories west of the Rhine – achievements that had eluded previous French governments for centuries. 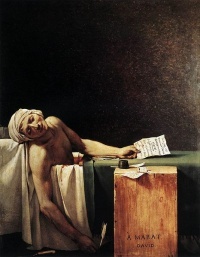 Internally, popular sentiments radicalized the Revolution significantly, culminating in the rise of Maximilien Robespierre and the Jacobins and virtual dictatorship by the Committee of Public Safety during the Reign of Terror from 1793 until 1794 during which between 16,000 and 40,000 people were killed. After the fall of the Jacobins and the execution of Robespierre, the Directory assumed control of the French state in 1795 and held power until 1799, when it was replaced by the Consulate under Napoleon Bonaparte in 1799. 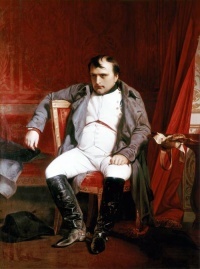 His dictatorship demonstrated undisputed military genius that took France through a series of wars. He was finally defeated in 1815 by a coalition of almost all of Europe, but not before spreading French revolutionary ideals across much of the continent. Historians debate whether Napoleon was the highest achievement of the Revolution or an entirely different direction. The modern era has unfolded in the shadow of the French Revolution. The growth of republics and liberal democracies, the spread of secularism, the development of modern ideologies, and the invention of total war all mark their birth during the Revolution. Subsequent events that can be traced to the Revolution include the Napoleonic Wars, two separate restorations of monarchy (Bourbon Restoration and July Monarchy), and two additional revolutions (1830 and 1848) as modern France took shape. The Causes of the French Revolution are very significant historical factors lending to the instigation of the French Revolution. France in 1789, although facing some economic (especially taxation) difficulties and simplicities, was one of the richest and most powerful nations in Europe; Additionally, the masses of most other European powers had less freedom and a higher chance of arbitrary punishment. However, at the time Louis XVI called the Estates-General of 1789, his government as well as the nobility had become clearly unpopular. The Ancien Régime in France was brought down partly by its own rigidity in the face of a changing world and partly by the ambitions of a rising bourgeoisie, allied with aggrieved peasants, wage-earners and various individuals of all classes influenced by the ideas of the Enlightenment. As the revolution proceeded and power devolved from the monarchy to legislative bodies, the conflicting interests of these initially allied groups would become the source of conflict and bloodshed. The excesses of the French Revolution are so numerous and so noteworthy that the phrase "excesses of the French Revolution" brings up 232,000 hits on Google Books as of early 2014. Some speak of a genocide. Notable episodes in the history of these excesses are the September Massacres, the guillotine executions, the Reign of Terror, the dechristianization, the drownings at Nantes and Republican marriages, The Death of Marat, the beheading of Louis XVI, the War in the Vendée and the death of Princess of Lamballe. Denis Diderot is infamous for suggesting "may the last king be strangled in the bowels of the last priest." In the arts, an exemplary illustration is Petit Souper a la Parisienne (1792) by James Gillray and the Desastres by Goya. Richard Davenport Hines has called Frankenstein the most enduring parable of French revolutionary excess. The cause of the revolutionary excess was sought in the cult that grew up around Jean-Jacques Rousseau after his death, and particularly the radicalized versions of Rousseau's ideas that were adopted by Robespierre and Saint-Just during the Reign of Terror. It caused him to become identified with the most extreme aspects of the French Revolution. Burke's "Letter to a Member of the National Assembly", published in February 1791, was a diatribe against Rousseau, whom he considered the paramount influence on French Revolution. Unless indicated otherwise, the text in this article is either based on Wikipedia article "French Revolution" or another language Wikipedia page thereof used under the terms of the GNU Free Documentation License; or on original research by Jahsonic and friends. See Art and Popular Culture's copyright notice. This page was last modified 20:26, 6 June 2015.